Fibershed has moved and bloomed…. we’ve loved our little home at this wordpress blog, it has been a nurturing and supportive locale, but it was time to grow and thus find a new home. We searched for just the right place… and we think we’ve found it. This new abode allows us to more deeply connect with our community, by giving us the ability to retain our blog, while having a website, and a place for our emerging marketplace. So come on over! 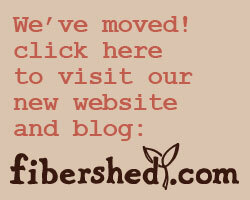 Click here for our new Fibershed location. But we have come a long way.. and the ‘we’ really became a ‘we’. This image is a reminder of this journey– it all started with Heidi Iverson, Paige Green, and the love of natural dyes. It grew into a community 30 times that size. On our one year anniversary we bring the original team back together with a twist. 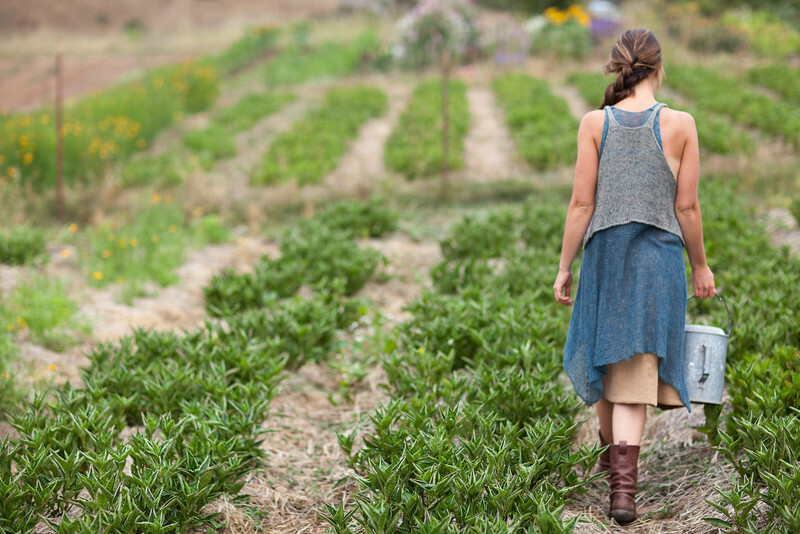 Here’s a Heidi Iverson hand-knit Sally Fox cotton tunic in two layers, dyed in indigo– worn by me at the dye farm, picture taken by Paige Green… thanks ladies, we wouldn’t have been able to do this without you. This way of living is about walking forward down the path. The questions that now reverberate through me are ones of agriculture, land, mills, jobs, water, wool, carbon, cotton and community, and until those explorations and solutions are carried out and found… I and the many other’s involved keep going. Meet Kacy Dapp, a modern day artisan whose life has been consciously crafted to balance the needs of the individual with the reality of the times we live. Her personal passions are carved from a value system of self-sufficiency, community building, and a quest for simplicity. Weaving, knitting, sewing, spinning, guitar and dyeing are all skills Dapp has explored in increasing and varying depth. 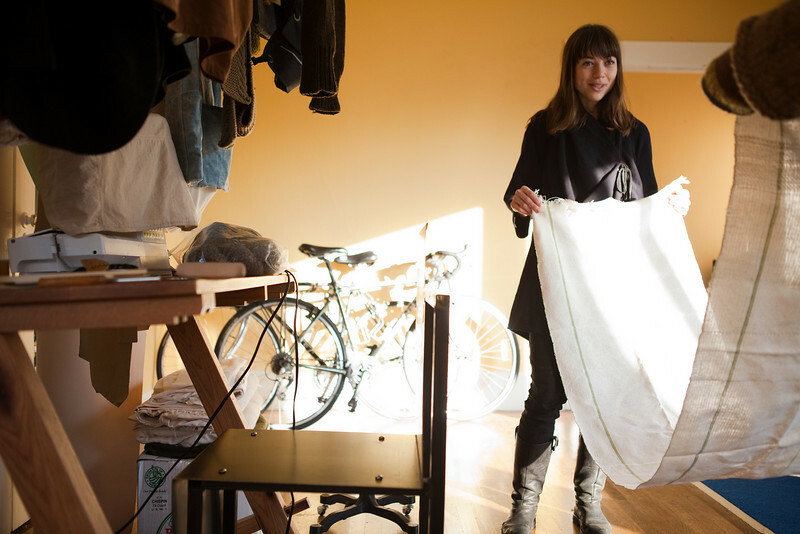 Her bicycle is her chosen mode of transportation– unlike the average weekend journeyer, or commute-to-worker… Dapp goes everywhere on her favored two-wheels, including a weekend ride she made through several counties to get to a natural dye workshop. Dapp grew up in Los Angeles, and moved to San Francisco as a young adult to study. ‘In 2005, I moved to San Francisco to attend SFSU, majoring in apparel design and merchandising.’ Dapp then moved to New York City for an internship and within a short period of time had opened the doors of her first shop. Dapp gave classes in how to construct one’s own clothes, as well as offered ready and handmade goods, ‘I offered free workshops. I did and do not want commerce to mean commercialism.’ Down to the very nails, the store was constructed with local materials and local labor. As we constructed the year’s clothing from our local fibers and dye plants, we were managing our resources with extreme care, there were only so many available skilled hands– and each pair of them needed to be focused on ‘just the right pieces’. At the point at which Dapp became involved, the need for a specialized wool shirt was becoming increasingly more evident– and not just any wool top, but one that could function as an insulating base layer. In Dapp’s characteristic positive and generous way, she took on the challenge of a fitted wool base-layer, without hesitation. 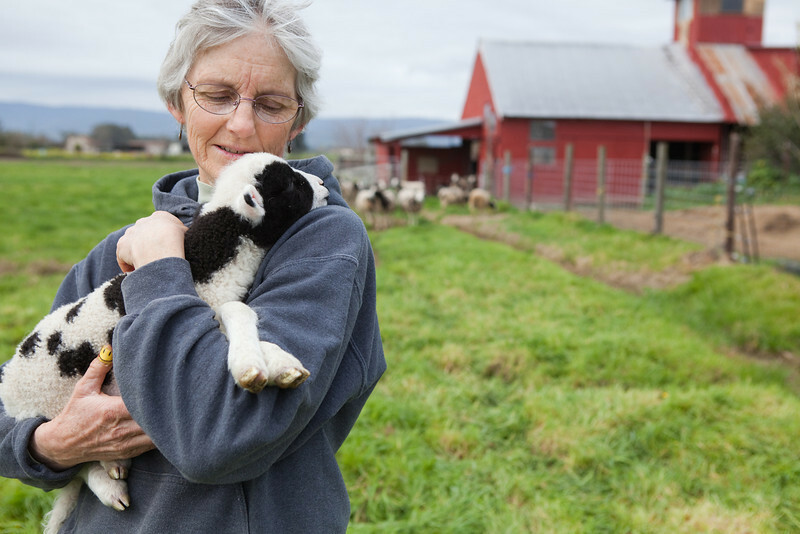 Dapp was paired with Solano County Rancher, Robin Lynde, who runs a flock of Jacob’s sheep in California’s Central Valley. The two met at a Lambtown natural dye event that Robin generously hosted on her land, (this was the same dye event that Dapp rode for two days to get too!). 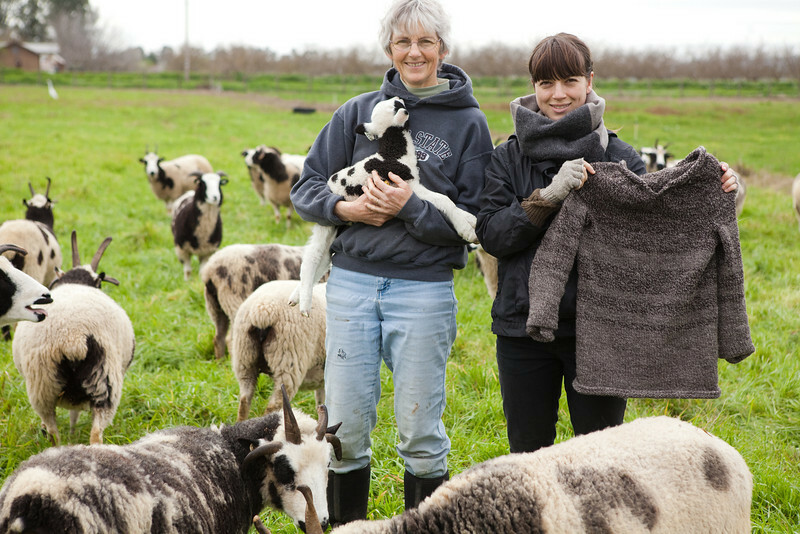 Lynde has a long history of not only raising her sheep, but in processing and weaving their wool. She is also famed for playing a large role in her region’s agricultural community. This combination of artisan and farmer all in one, seemed like a natural match for Dapp’s Renaissance-woman skill base. The two have a lot in common. As the day closed on the original natural dye event where Dapp, Lynde and I were all present… so many months ago, the discussion of including Dapp’s knitting skills into the Fibershed project were just taking hold– it seemed like the best way to get moving on the collaboration was to take a look at the yarns that were right there at the farm…. 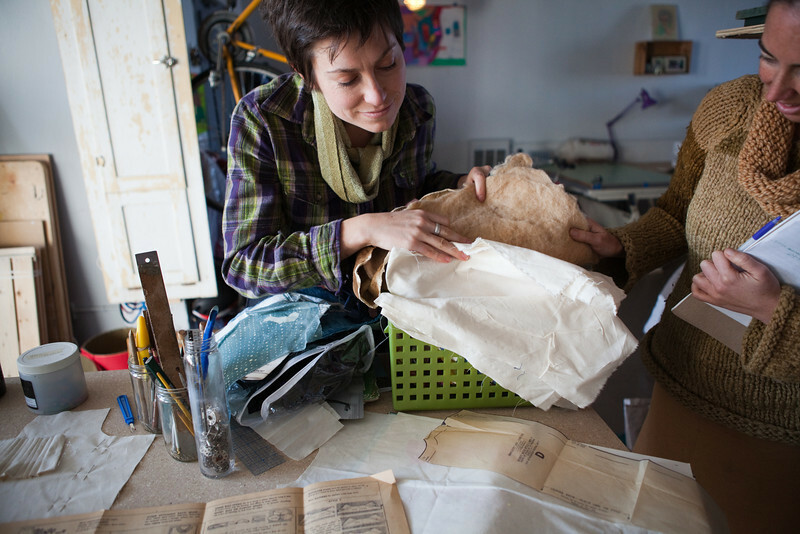 so Dapp and myself made a journey into Lynde’s studio to check out her range of raw materials. 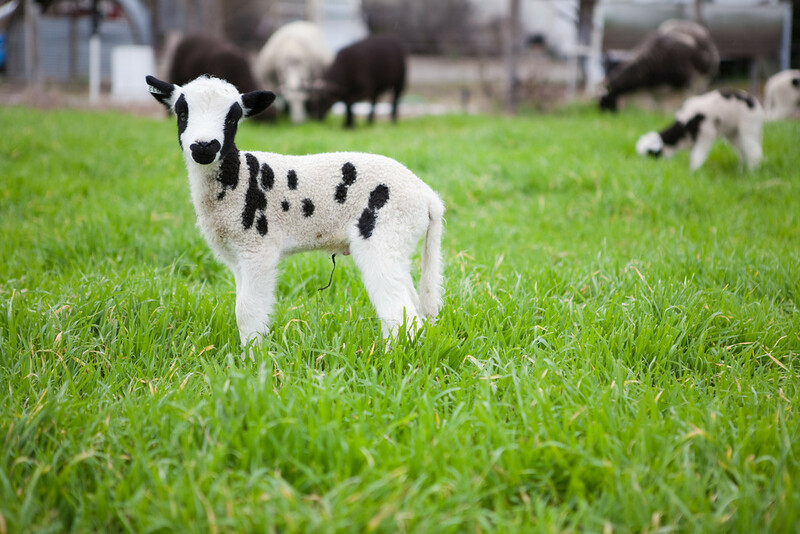 Lynde’s heirloom herd, with their modeled black and white fleeces create some of the most uniquely beautiful spun yarns– the echos of the black and white spots appear as a speckled gray to the onlooker. It was this strong patterning, and perfect softness that drew Dapp and I to settle on these raw materials. 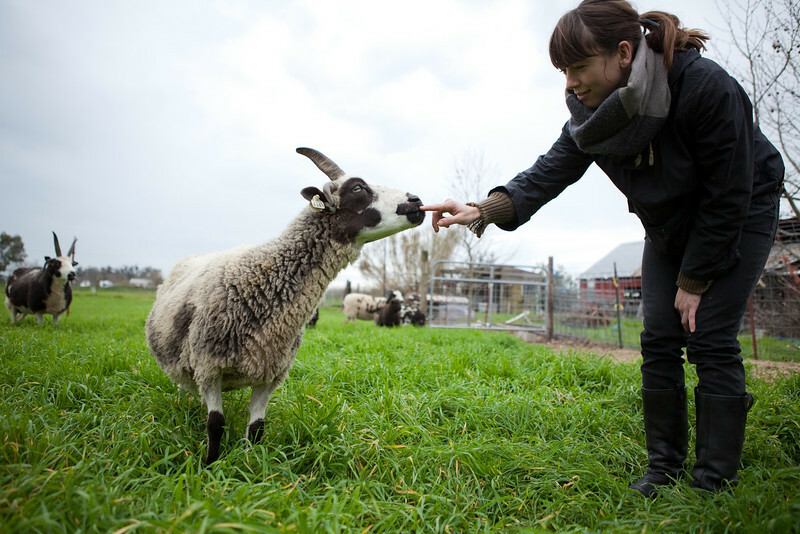 As knitter and farmer shook hands, (so to speak), the yarns were passed from their source at the farm, to Dapp, and her Oakland studio, a short distance of 53 miles. In their new home, they would be recreated into a wearable garment with Dapp’s knitting needles. Dapp combined the idea of a shirt with that of a sweater, drawing from multiple inspirations– including the wisdom of knitting legend Elizabeth Zimmerman. The length was carefully constructed to be long enough to fit over the waist and to the base of the hips– an important characteristic of a cool-weather garment, which you need to cover your midsection even as you bend and twist. This is the type of garment that you want with you at all times….you can wear it under a larger coat or sweater, or it can function on its own. It exudes function and beauty at every level. When Dapp was asked what changes had occurred for her during her work on this garment, her response was one of transformation. 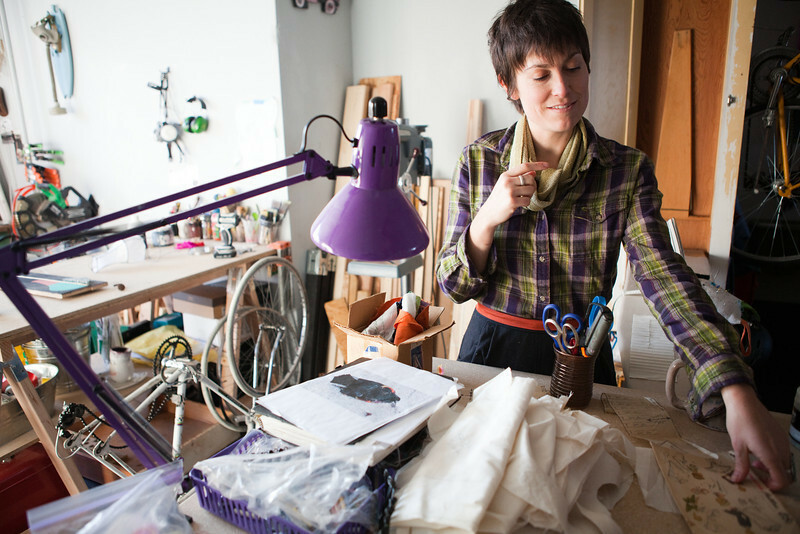 ‘Through working with Fibershed, I recently had the epiphany that I don’t necessarily need the materials I initially envision for a project. There are an abundance of ways to complete a project and I’d rather look at what’s available rather than what I desire as the process of completion is just as exciting as the finished piece if I allow it to be. I also love the reassociation with clothing that the project gives me. She also suggested how the project could encapsulate a whole life approach, ‘Ideas for the future would be to consider recycling materials, food and shelter in the paradigm as that would make a complete circle. I’d also love to discuss the animals involved and how they can be treated to ensure the project is not only healthy for people, but for the land and the animals themselves. Thank you Kacy, Robin, Paige, and the many Jacob’s sheep who lent their efforts to the creation and documentation of this story… and this garment. 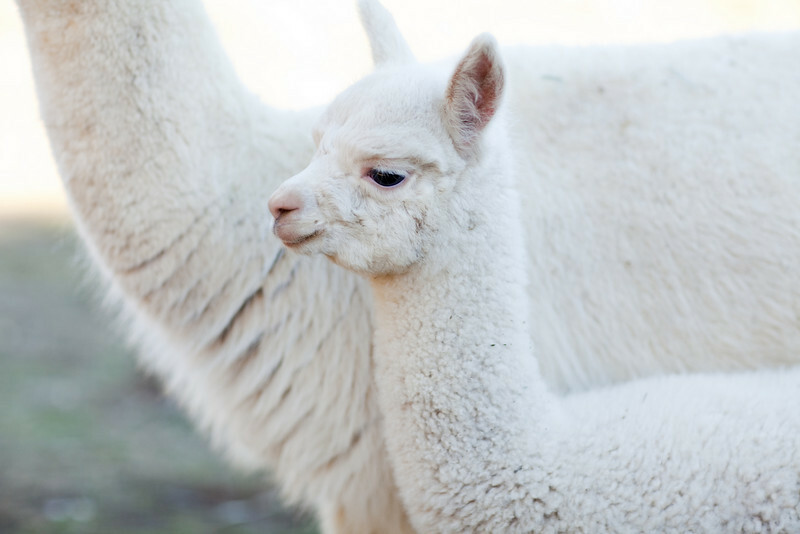 Believed to be a gift from Pachamama, the sacred earth mother– alpaca have been present during the rise and fall of many human civilizations from the point of their domestication 6,000 years ago. As the lives of the alpaca and humans became increasingly and intricately woven within ancient South American culture, they became revered and honored for their integral place in pre-Colombian society. The people of the Andes developed an exquisite language of gratitude for the animals who became a vital source of food, fiber, fuel and skins. The people and their herds co-existed peacefully until the 1500’s, until the alpaca, like the Incan culture as a whole was met by the invasion of Spanish colonists. The animals were massacred by the millions by militia members who saw them as the linchpin to the Incan empire, and did everything in their power to decimate all aspects of the indigenous culture. The alpaca were relegated to high mountain plateaus– where they remained safe and protected from modern European weaponry. 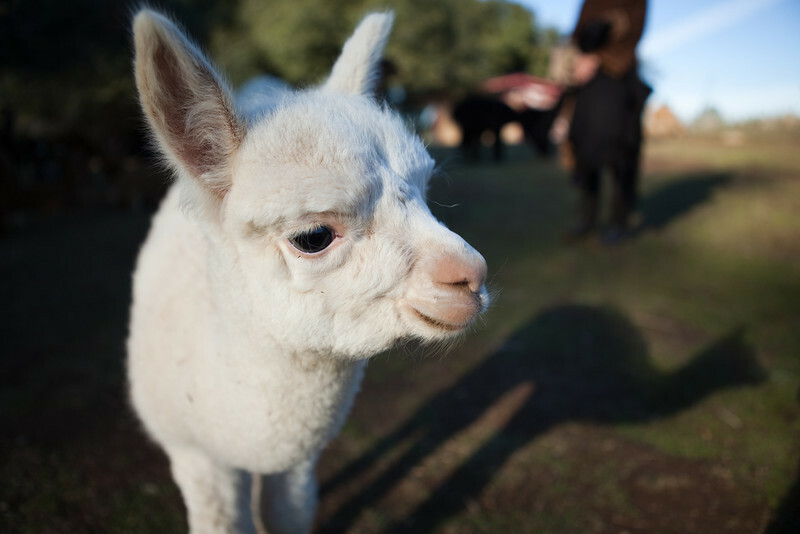 Today less than 4.9 million alpaca exist. They are a species whose numbers are still recovering from 500 years of history. There are few farms that we have visited within the Fibershed who carry the knowledge and responsibility of this historical narrative like the Rosenfeld family of Mt. Aukum, California. 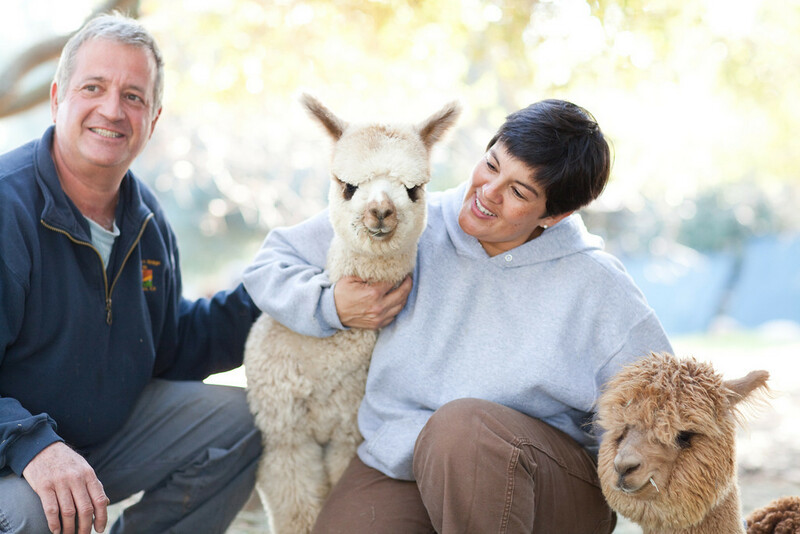 Julie and Ken Rosenfeld are stewards for a most extraordinary flock of alpaca. While visiting their solar-powered ranch in the eastern most stretches of our Fibershed, we were introduced to these four-leggeds–better known as Kachina, Celeste, Blackberry, Guns N’ Roses, and Jesse James (just to name a few). Taking a virtual tour of their herd on the families website, one can see the carefully organized family tree that is the well hewn work of an extensive breeding program. “It is so important to be making careful breeding decisions that improve the strength of the species. This animal has now, for numerous reasons, been put in our care… we owe it to them to do this right,” said Julie Rosenfeld during our interview. 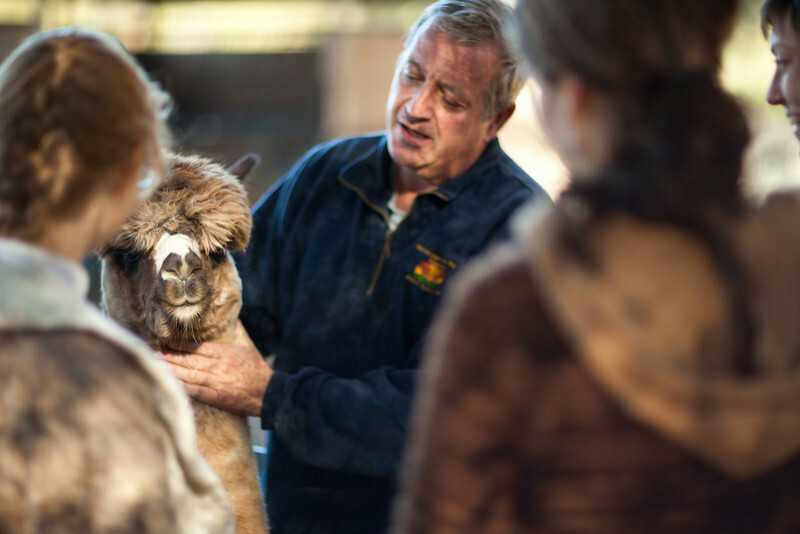 Breeding is about honoring the overall health of the animal, fiber being one facet of the alpaca’s overall genetic make-up. Julie’s husband Ken started his career as an OBGYN in Boston years ago, his original training in the sciences and in the birthing process has assisted the couple’s ability to deal with the complexities of breeding. Renassaince Ridge is both a model for good rearing as well as good land management. 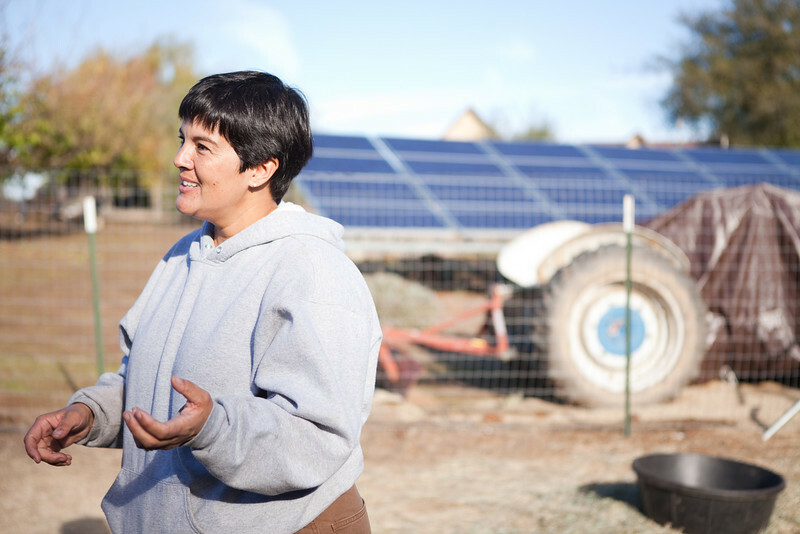 The electricity for the ranch is generated from a solar grid, the pastures are well covered with organic feed, no signs of erosion or over-grazing exist anywhere. The herd looked perfectly at home standing on the rock studded oak and pine woodlands that make up the topography of Mt. Aukum. 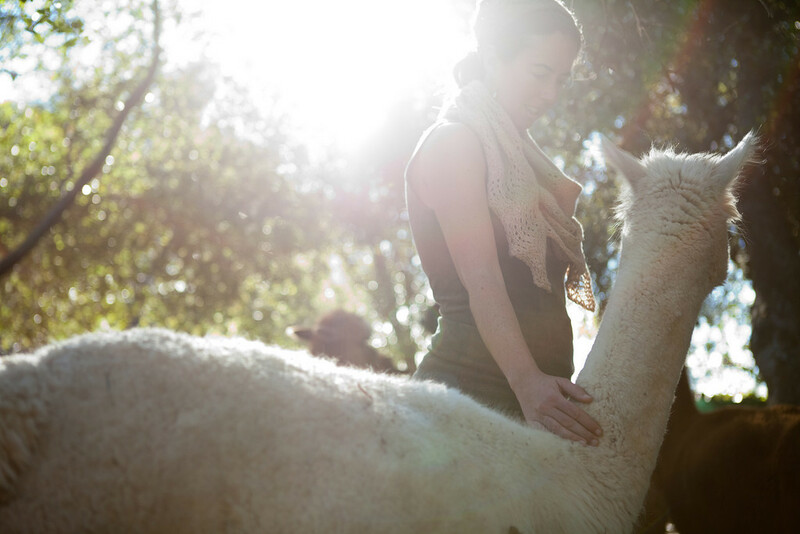 Those who raise and rear alpacas are drawn to the work for a multitude of reasons– fine fiber being one of the foremost mentioned…and there is good reason for this– it has become hailed as the “new cashmere” by many in the garment industry. The fiber has a hollow core and few scales, allowing it to be very warm and extremely soft simultaneously. Because it is hypo-allergenic many people are able to wear it who find wool irritating to their skin. The fiber has no lanolin, or “grease” and thus does not have to washed in the way that wool does, saving massive amounts of fresh water resources. 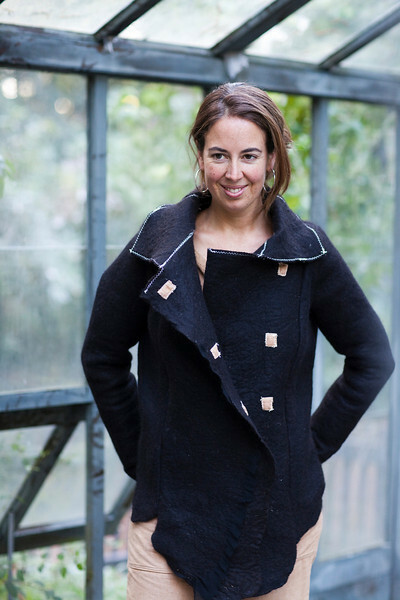 This handcrafted black coat was felted by Katherine Jolda and sewn by Mali Mrozinski. The fiber was generously donated by Blackberry (not pictured), and Tempest (seen above). We wanted to illuminate the stunning options that can be created from the colored fleeces– without utilizing black, gray, and brown chemical dyes. (Synthetic dye applications are typically the most carbon intensive processes of the conventional textile supply chain). And yet, utilizing non-synthetic and botanic based dyes on the white fleece creates an exquisite foundation for fennel, horsetail, and toyon dye baths, (all naturalized or native species to our California floristic province). Each of the animals that came close enough to smell the fibers gave the garments a sniff and a nudge– showing signs that there was something familiar in regard to what I was wearing. Alpaca fiber has an incredible sheen, it takes the dyes more lightly than wool, and tends to enhance the pastel-like quality of all the botanic colors. The drape that the fiber creates within a finished garment is sought after by those looking to make clothes that will flatter the contours of the human body. The lace weight Victorian-Era inspired shawl (worn in the above picture) was created by Gale Ulvang of San Anselmo. 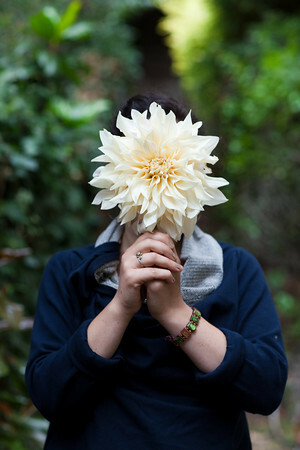 Her work and patterns are featured on Ravelry…. search for “galeu” for more of her knitwear. This piece was designed and knit by scientist and knitwear designer Danielle Svehla– no dye work necessary. 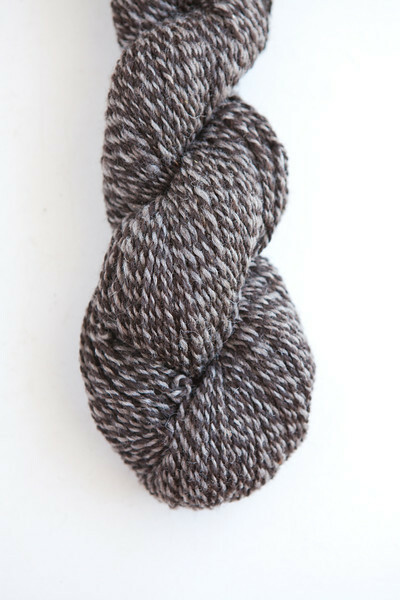 The carmel and dark brown colors are a product of the natural alpaca fibers. This is the most ideal sweater I could have asked for… it is warm, soft, and purely insulating. 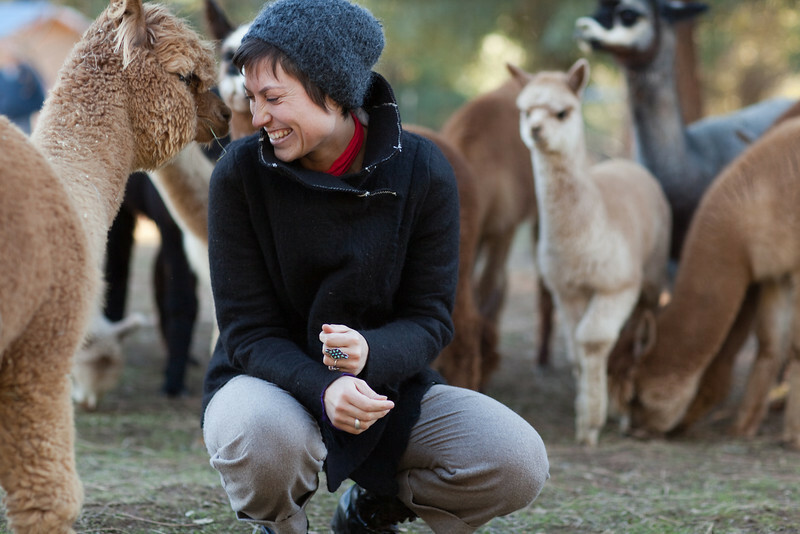 The weight of the sweater is what catches you– it is heavy– but that weight is grounding and comforting, like being hugged all day long by Kachina, (the most friendly of all the animals in the flock). 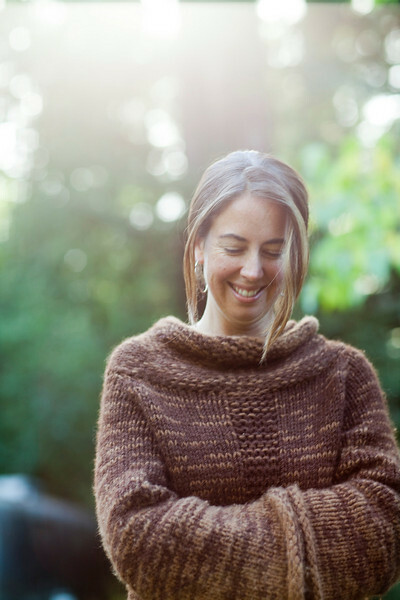 Given how amazingly warm, gorgeous and completely functional this piece has proven to be for me over the last year… we have been inspired to offer the pattern and yarns to all those who want to make their own Fibershed sweater. The intricate details are just now being worked out and the DIY local clothing kit will soon be available in our marketplace. 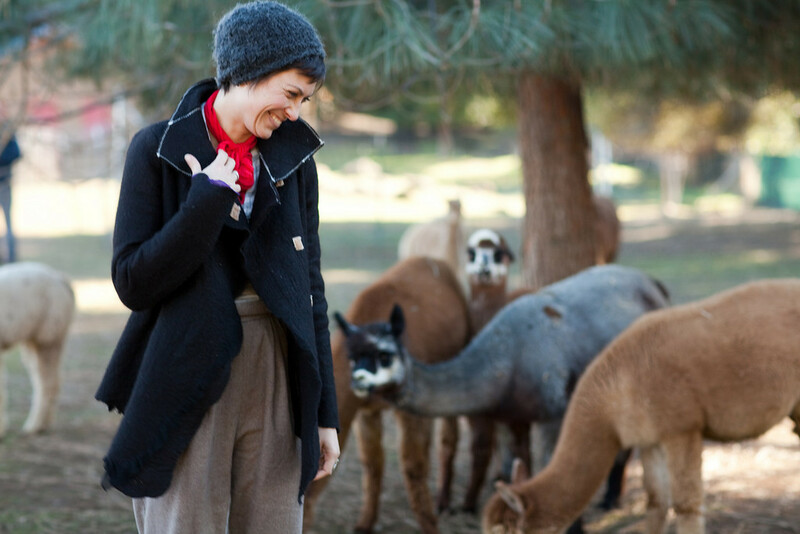 There is nothing like wearing a garment from an animal that you have be-friended. The reality of the sweater takes shape– it is no longer a layer of cloth next to the skin, but a part of the living, breathing daily life– supporting you, reminding you of your connection to the seasonal, annual and longer life cycles that define you and your engagement with all that lives. If these animals are beginning to intrigue you… I completely understand– I haven’t been the same since my visit to Renaissance Ridge. 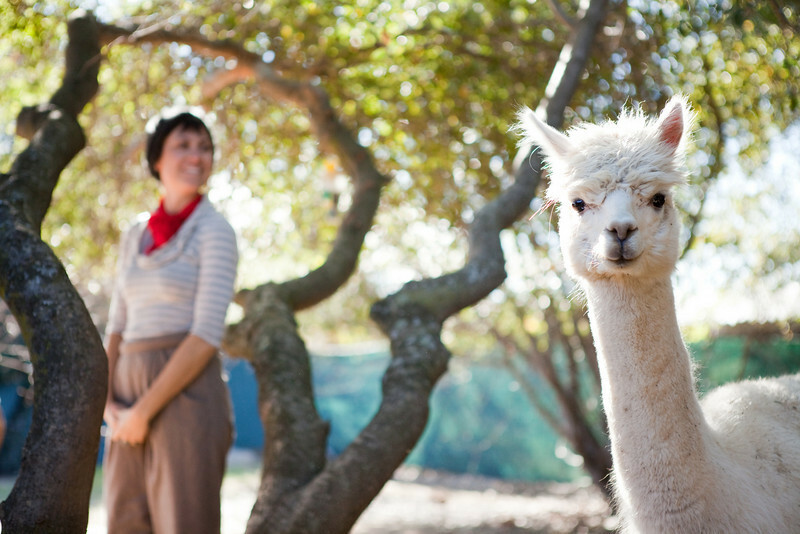 Life is different once you cross paths with the alpaca. Their gentle and curious way slows you down and wakes you up in a manner incomparable to other encounters. 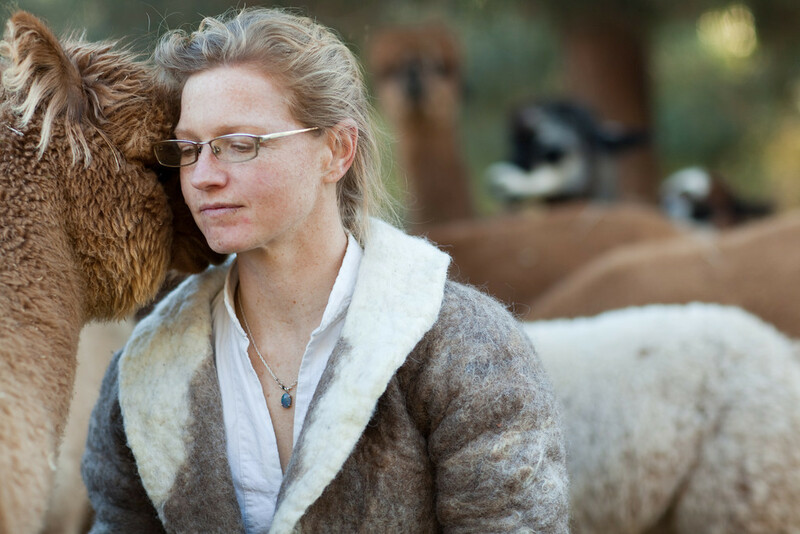 If you dream of starting your own alpaca herd… the Rosenfelds are available to answer your questions. 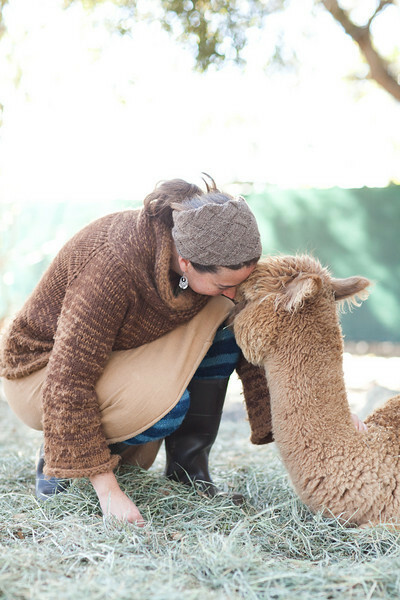 They are often called upon to help people discern if alpaca rearing is the right path. Pokeberry and Indigo were dipped in merino wool that was graciously donated by “Reba” a sheep from the Potter Valley in this sweater tunic designed and knit by Sachi Henrietta. 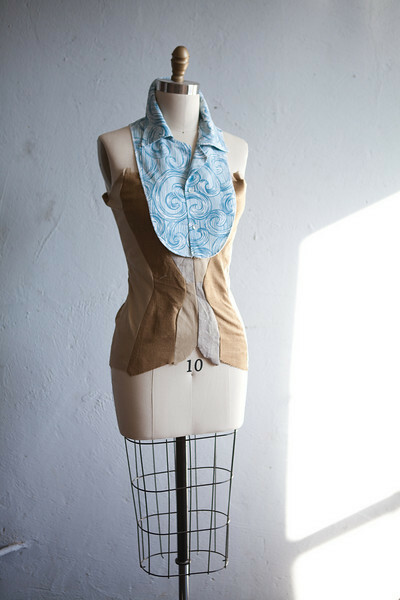 The piece was worn atop Foxfibre buffalo brown cotton leggings. 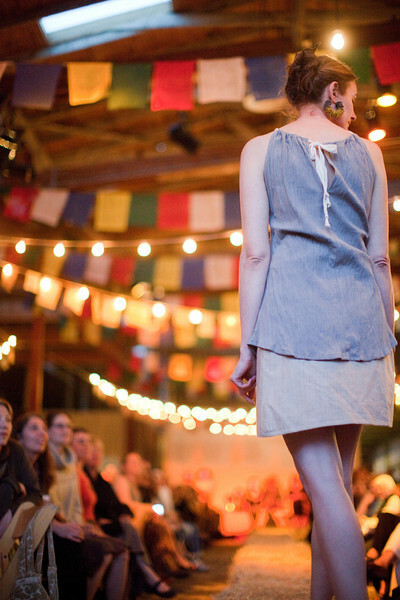 Fibershed Fashion came alive for the community during our first ever benefit celebration. 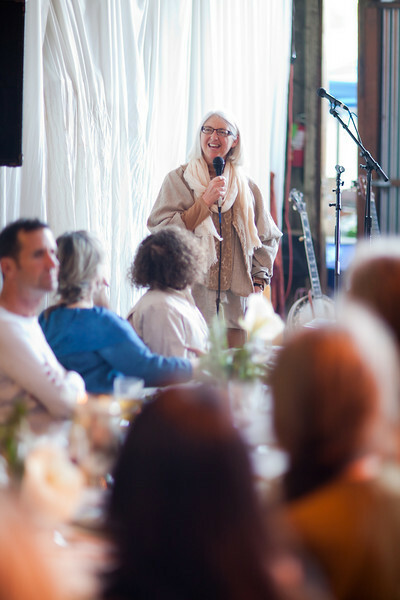 One hundred and eighty individuals from throughout Northern California came together during a sold-out celebration to raise money for our first solar powered community based mill. All food and fiber were carefully sourced from within our region. Sally Fox harvested lamb for the stew, the goat was brought in from Rossotti Ranch, the corn tortillas made just north of us. The bread from Brickmaiden Bakery– was adorned with Carmody cheese from Bellweather farm, Foggy Morning rounds from Nicasio Valley Cheese, and Cowgirl Creamery’s St. Pat. The nettles, douglas fir tips, and wild mustard were harvested by my dear friend Mia Andler. My brother Michael made a rose, and gogi berry flavored kombucha, Wild West Foods made an original dandelion, nettle and cleaver ale, Molly Myerson baked the strawberry rhubarb pies. Eamonn made the chocolate and vanilla cheesecakes, local vintners Lou Preston, Porter Creek, and J-vineyards provided amazing Pinot Noir, Syrah, and Chardonnay. The local apothecary made a blend of medicinal “dye tea”. 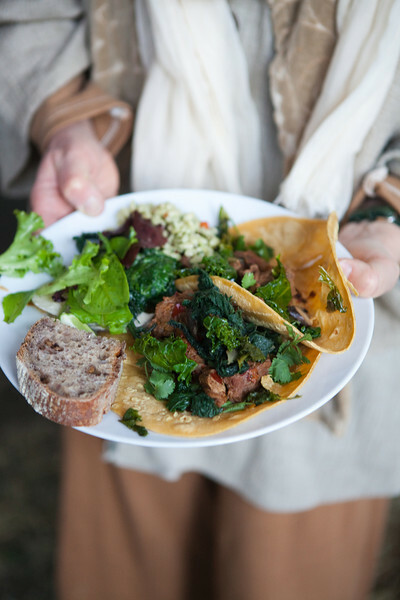 The entirety of the meal was composed and brought to incredible life by John Murray– a talented San Francisco based chef, who poured love into every detail. 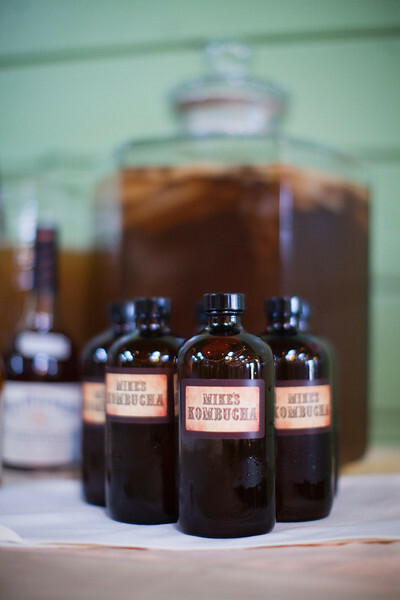 The rose, gogi, and original kombucha was a complete hit. Everyone who imbibed in this drink, had words of praise for its maker– who was also the bartender. 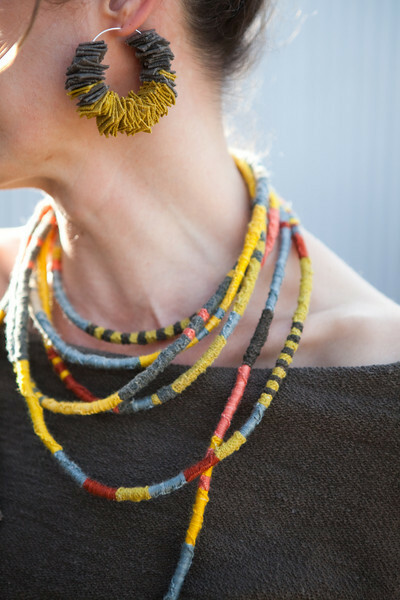 Kacy Dapp wears a pair of earrings made by Dyan Ashby, constructed of Sally Fox’s cotton dyed in oak galls, and felted wool beads. 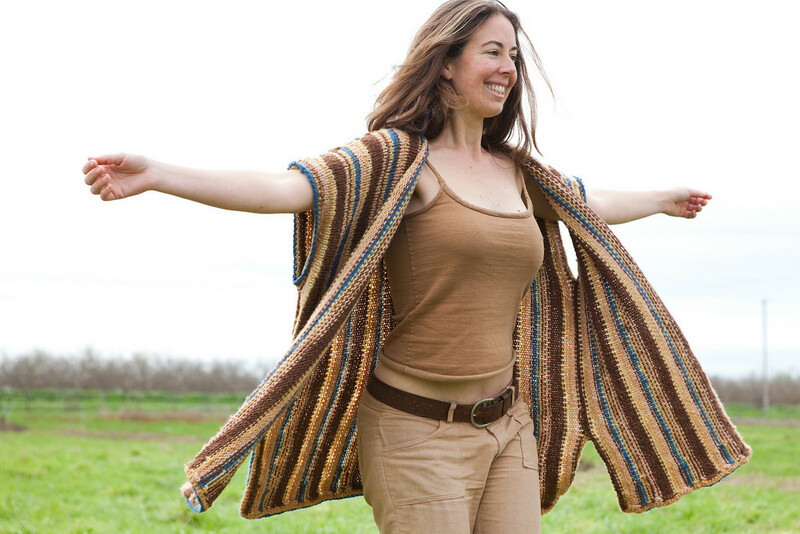 Her sweater was made by the Black Mountain Weaver’s collective of Point Reyes Station, the wool is from the farm of Mimi Luebbermann and Martha Cant of Starbuck Station. The models for our event were all amazing community members, a group of women whose beauty shined from the both the in- and outside. 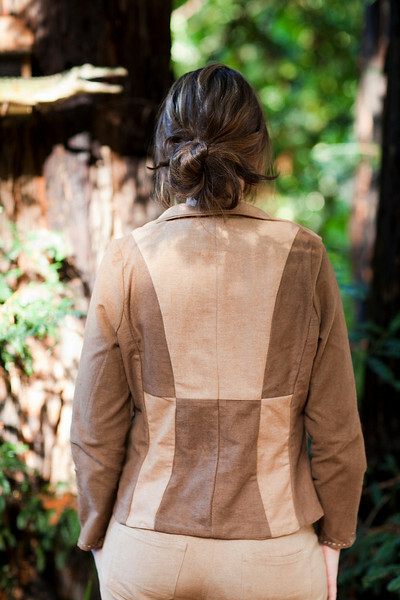 June wears a jacket designed by Amber Elandt, made of Sally Fox’s french terry cotton, dyed in a light iron and oak gall combo. 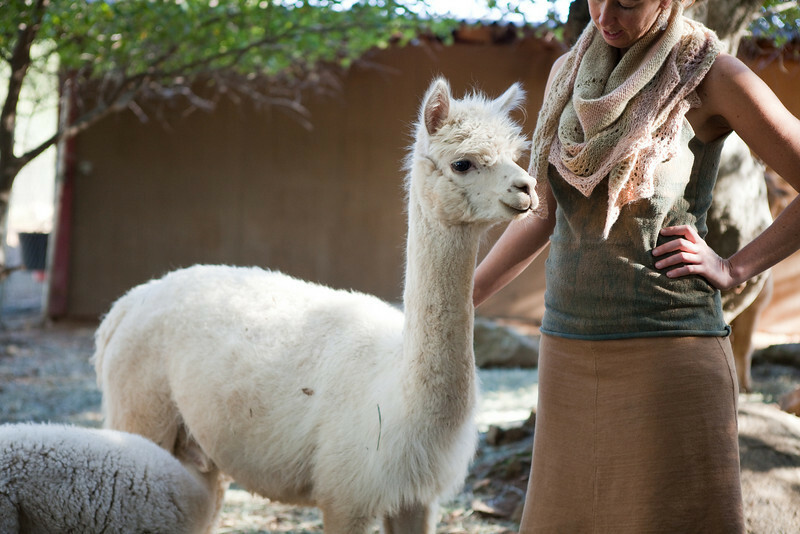 Her lovely scarf was hand knit by Gale Ulvang in Renaissance Ridge alpaca yarns– I dyed them in horsetail, fennel, and toyon. Lily (top of stairs) wears a handwoven Viyella dress (cotton and wool blend), designed and created by Susan Hayes, of Susan Hayes Handwovens, the cardigan was hand knit by Heidi Iverson using three of Sally Fox’s yarns together– one strand dyed in Mt. Barnaby indigo. Jalena (far right), wears a Kacy Dapp hand knit piece made from Robin Lynde’s natural colored Jacob’s sheep wool. 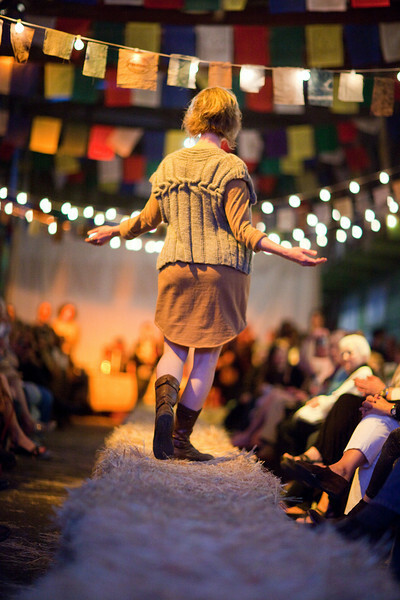 Sally Fox welcomed the Fibershed community together… asking every weaver, knitter, farmer, and seamstress to stand and be recognized for their skills, and for their commitment to creating this movement. 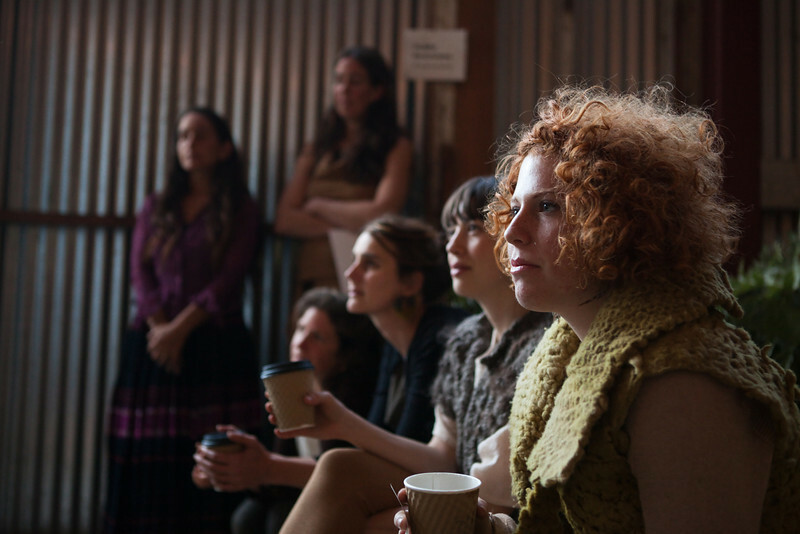 “We are the Fibershed,” she said to a full house of inspired individuals. 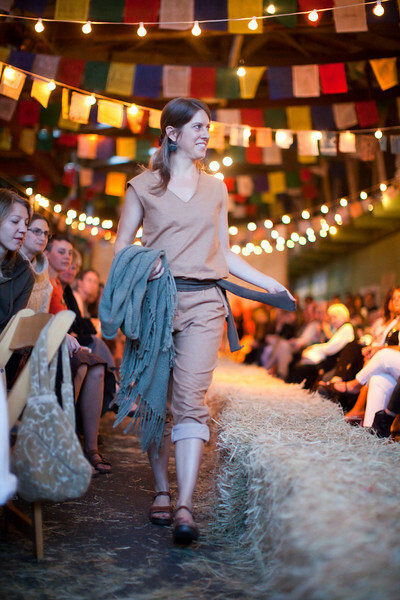 Dyan Ashby elegantly walked the straw bale runway– wearing a Viyella shirt made of black wool and cotton, and a Foxfibre woven skirt– all pieces she made specifically for the show. 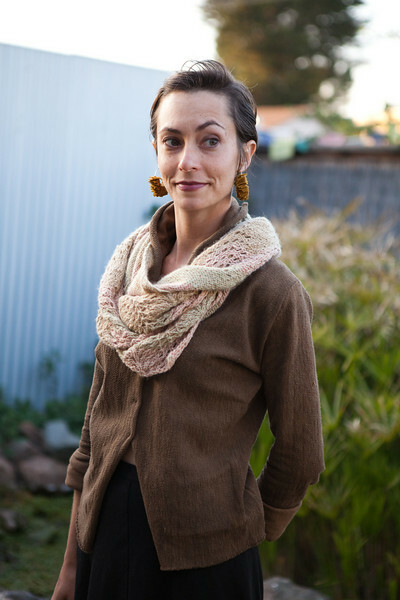 Sierra Reading wears her amazing Sue Reuser Cormo wool vest that she hand knit, felted, and dyed in onion skins and iron. A beautiful piece, whose color and texture are reminiscent of a wild moss covered tree. Eden Trenor was just the right fit for the Mt. Barnaby indigo dyed capri pants made of Foxfibre flannel, sewn by Kerry Keefe. 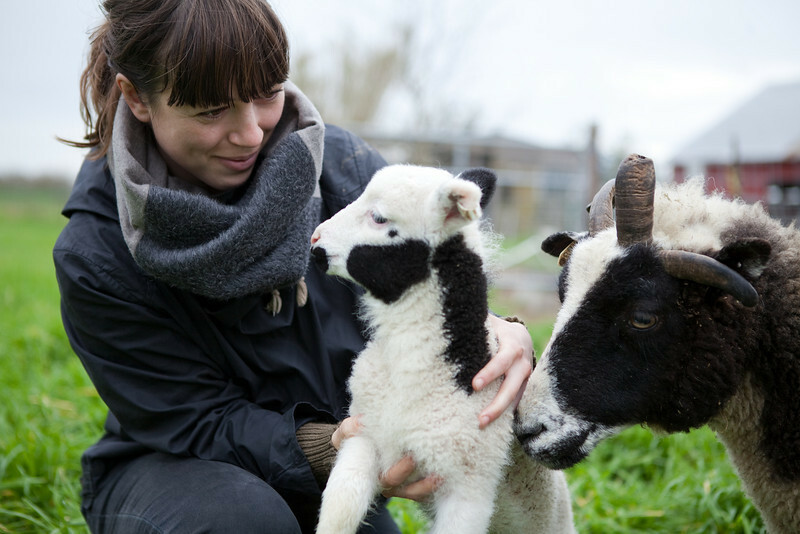 Zara Franks knit the shawl from Kenny Kirkland’s flock of mixed breed sheep. The shirt was made of a buffalo brown light weight Foxfibre knit. 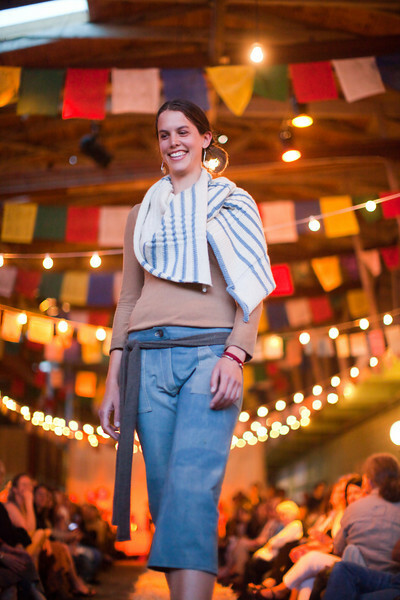 Stacie Shepp illuminated the playful aspects of the evening, as she danced down the runway wearing a piece that was hand knit and designed by Marlie de Swart of Black Mountain Weavers. “I’m so proud of this piece,” de Swart said with a smile, “All the wool is from Windrush Farm.” The sweater received many “wows” from the textile loving crowd. 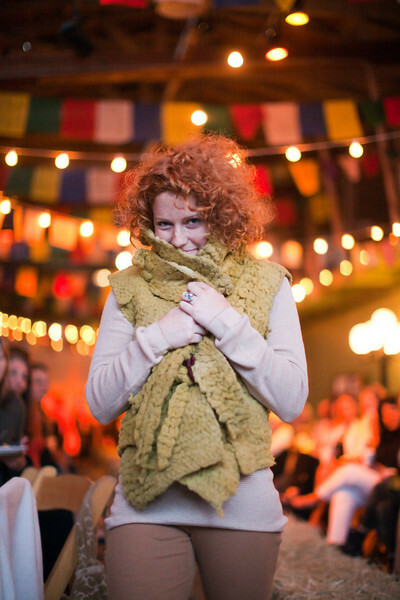 Dr. Sara Gottfried walked the catwalk like a pro, she wore Heidi Iverson’s two-layered hand knit foxfibre and Mt. Barnaby indigo piece with the vigor it so rightfully deserved. Dyan Ashby is shown here wearing her own hand-constructed and designed naturally dyed foxfiber jewelry. An exquisite compliment to the Fibershed offerings. 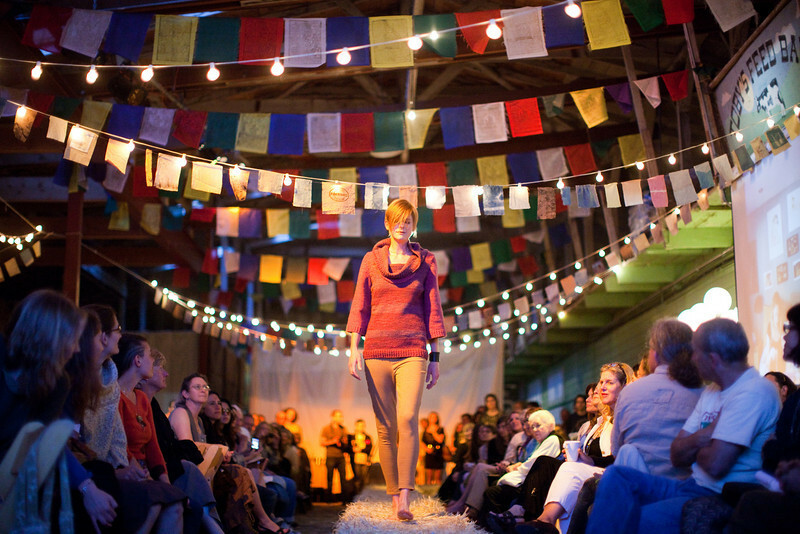 The night was brought to a new level of beauty with the music of Tim Weed– a wondrous local musician whose sound enhanced the feeling and experience of handmade..
We paid homage to the animals who make our clothes possible… some of them were kind enough to share the evening with us. 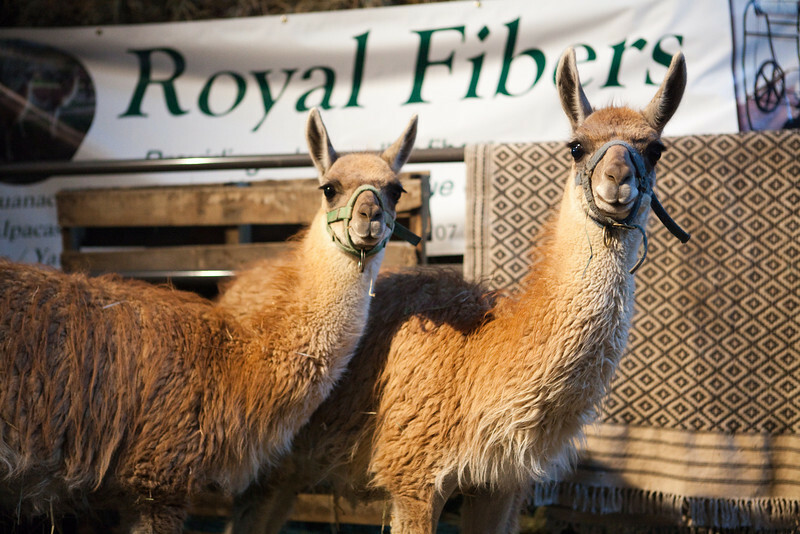 These are Guanacos from Royal Fibers farm. Here is the map of our Fibershed. 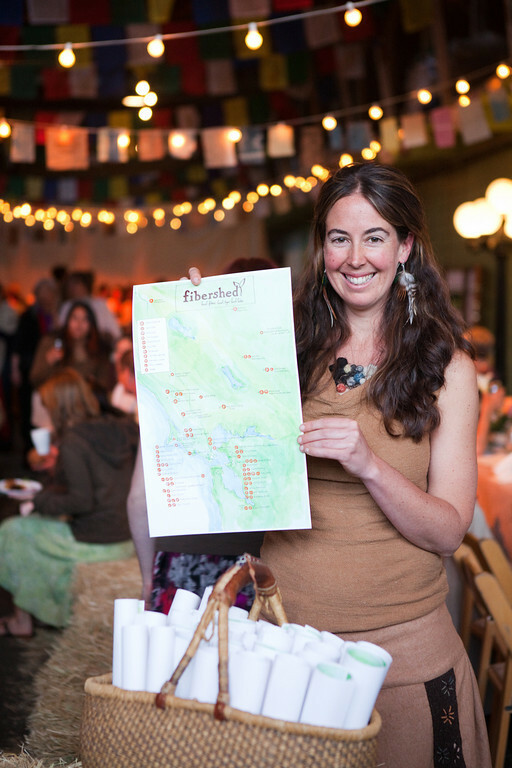 Each farmer and artisan is documented for their contribution– thank you to each and everyone who has made the journey possible, and continues to evolve the Fibershed into a functioning supply chain for which we can all participate in. We’ve begun the journey to re-weaving the community cloth… may the mill’s construction be swift, and come with ease and grace.. and may we all have the ability to wear local and regenerative clothes once again. There is a story in each garment, a living history of our collective experience resides in the implications and realities of our clothes. 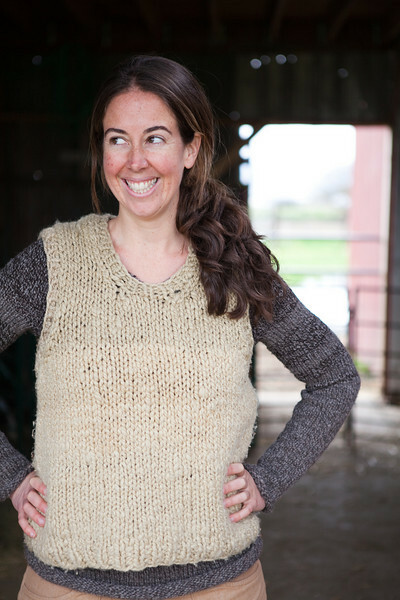 The wool in this tunic comes from the homestead of Kenny Kirkland. His flock is small in comparison to the flocks that live north and west of us– where 1,000 sheep per ranch is considered normal. In our current system the meat from these animals brings the highest margins, and yields vital wages and income. However, many resources lay wasted in the process of procuring this “one” economically viable product. 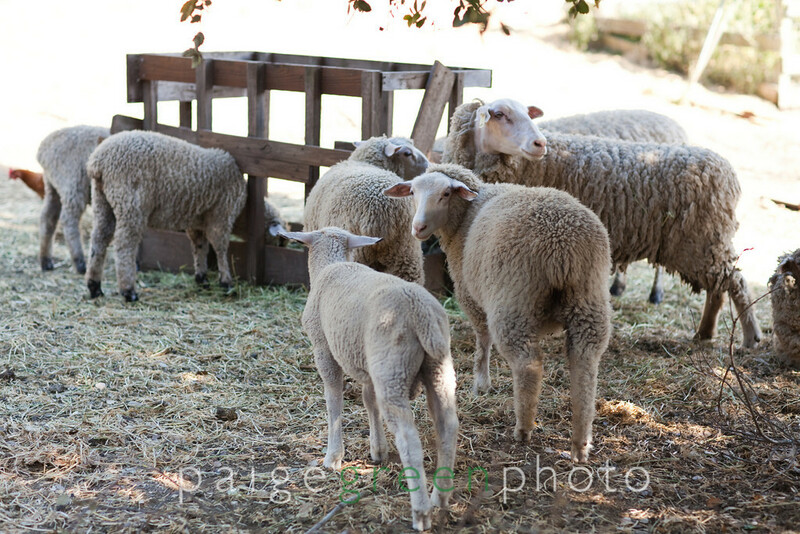 Making something from the wool is time consuming and proves unaffordable for many ranchers. What happens when we can’t get everything we need from somewhere else? So many of them in fact….that we are throwing away, and or, store-housing 22,000 pounds of wool annually, in my county alone. We haven’t seen so much as a sock available from our own “meat sheep” wool. Let alone the obvious and easy applications you would expect to see– duvet fill, mattresses, and housing insulation. Instead of making a mattress, we wanted to prove you could make something even more visually exciting– a garment so beautiful you don’t want to take it off. 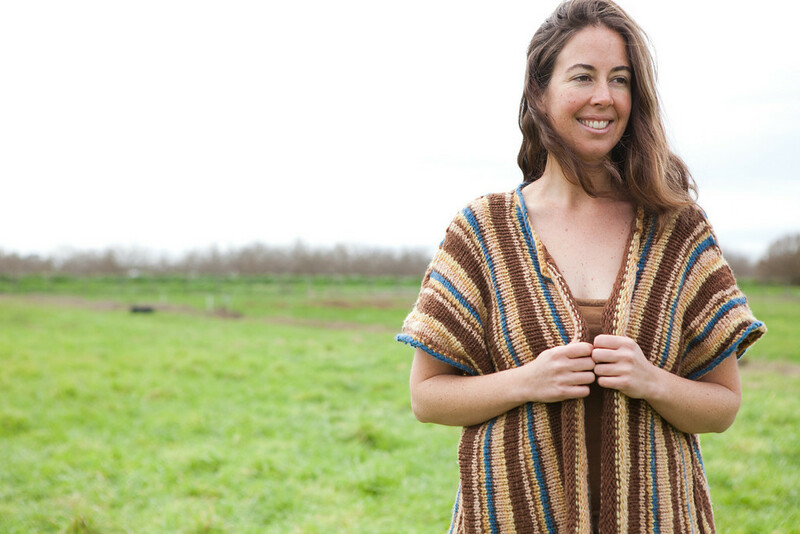 This tunic is made with the wool of a sheep named Saturday, spun and knit by the hands of local artisan Nance Ottentstein, dyed in the summer and fall harvested plants of black walnut, Japanese Indigo, coyote brush, and eucalyptus. This garment is a living symbol of what can be created when we focus on what is here and what is now. 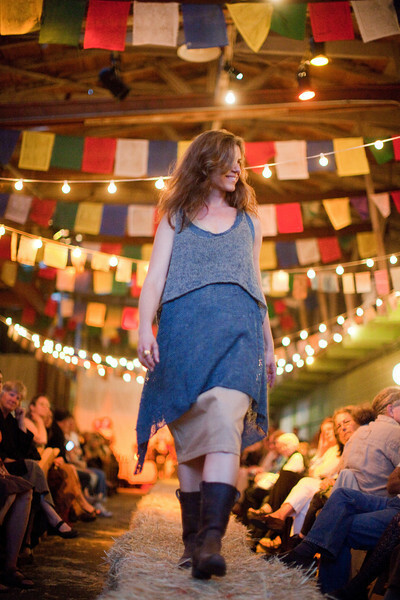 To see this garment in person, and all of the other Fibershed pieces, you’re invited to our benefit dinner and show… a celebration to bring the first solar powered farm-based mill into existence. 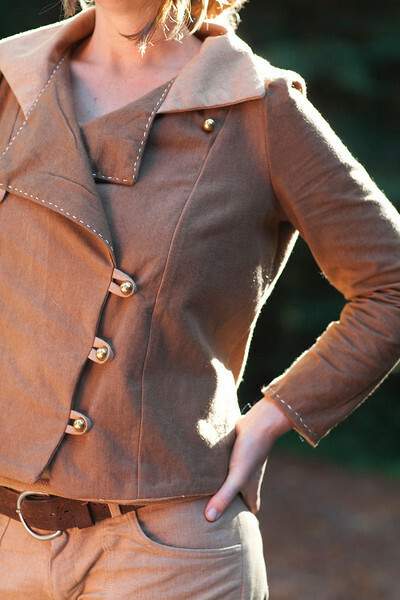 Soft and supple Mendocino buckskin, Sierra foothills alpaca, Mill Valley felt, Capay Valley color grown cotton, and Mt. Barnaby indigo … these are the places and raw materials that designer and artist Mali Mrozinski has been exploring. The “limitation” of sourcing materials within 150 miles might be better described as a “creative focus.” This palate of color and form has emerged through the processes and raw materials that Mrozinski and the Fibershed project have been researching and developing throughout the last six months. 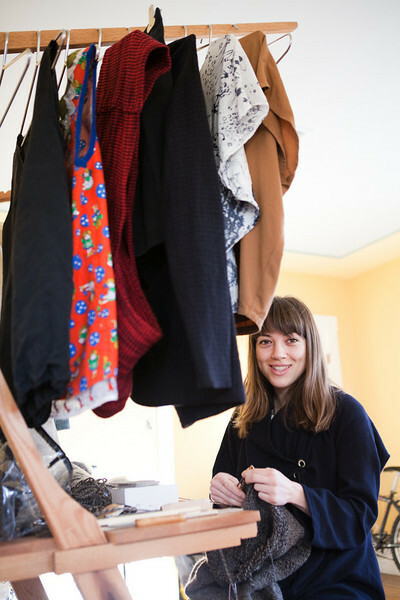 A skilled seamstress, and painter, Mali has exposed herself to a sprinkling of bioregional forms and colors, the outcomes of her exploration have become trusted garments in my small but incredibly well made wardrobe. Our first meeting was shared in a downtown Oakland Cafe after Mrozinski’s teaching gig at Creative Growth. We met with our mutual friend Dyan Ashby over a cup of tea and to exchange some color grown cotton fabric. I had been told of Mrozinski’s talents long before I met her, “she is a wizard at construction, her skill is incredible, her pieces are complex and detailed,” said Ashby. This interest in farm culture as well as a curiosity for well-tailored historical women’s patterns churned in Mrozinski’s creative mind as she explored local processing technique after technique. We traveled together to a two-day buckskin brain tanning workshop where Mrozinski fell into deep connection with the skins and furs of locally harvested animals. She rode the bicycle powered drum carder and made her own felt. She explored the in’s and out’s of fermented indigo, and played with the delicate yet hardy Sally Fox color-grown cotton flannel. Mali developed a meditative rapport with rabbit skin during our class. The material was a perfect size for the lap, and allowed for a comfortable processing method. “This skin is incredible,” I recall her saying as she nuzzled it to her cheek. Mrozinski is studying the possibility of making fur collars from locally harvested rabbits, whose skins often go to waste in the haste of procuring meat for the marketplace. “The amazing thing that I’ve discovered, is that my great aunt was a furrier,” said Mrozinski in a recent interview. Perhaps there is a genetic propensity for working with fur? If so, Mali is a likely inheritor of such a gene. Mrozinski has recently returned from a trip to Northern Pennsylvania. The Amish made a big impression on her– their simplicity, and their reliance on very few materials was an inspiration and a curiosity. ” I‘m so interested in how can you remove all the unnecessary, remain intentional, and slow down.” These questions are essential foundations for Mrozinski and the Fibershed project as a whole. How do you make the most with what you have? Contrary to the belief systems espoused by our culture that devours new product…we must remind ourselves that we are a creative culture, and a DIY culture too. 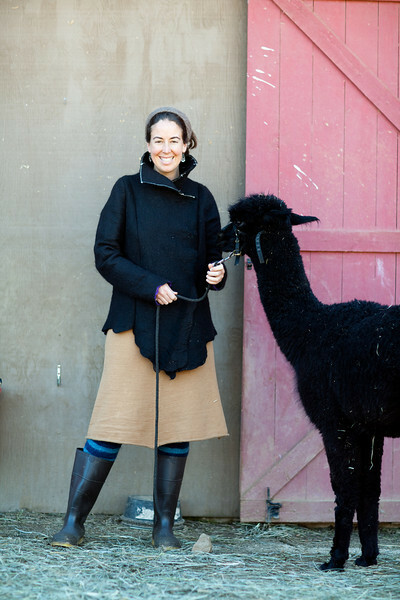 If it wasn’t for the commitment to limit our material base to local fiber producers, we would have never known that within 140 miles of our front door exists a herd of world class alpaca. Follicle testing proves the sire of this herd is not just extraordinary, but he actually produces the densest fiber in the world. In a rapid paced society that has created seemingly unending possibilities for material form, it makes all the sense in the world why an artist like Mrozinski, or any of us for that matter would desire to slow down, take stock of our own communities and resources, and figure out what in fact we might have been missing? 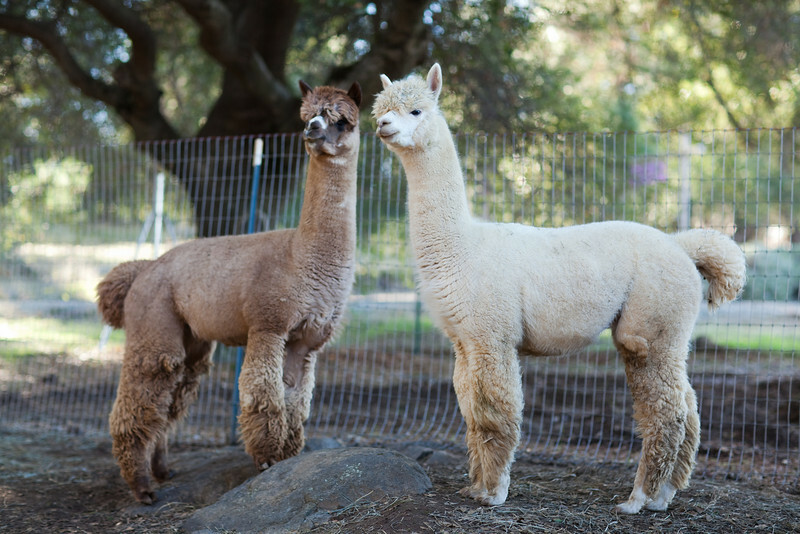 The story of Renaissance Ridge and this fabulous alpaca herd is the subject for our next post. We just wanted to pay mention to the incredible material that came from these lovelies- and pay our respects to Mali who worked tirelessly on the process of constructing this coat– adorned with magnets as closures, and sewn with organic thread (which proved very tricky! ), Mali pulled it off. She created a coat whose manufacturing consisted of no harmful processes. The already black fibers were gently sheared, wet felted by hand (by Katherine Jolda), and then hand-cut and sewn my Mrozinski– a completely local supply chain, from soil to skin….and while this coat is as ecologically friendly as they come… it seems everyone dies for it when I’m walking down the street… there is some longing and pain involved when they realize it is not off the rack. Mrozinski’s hands have been fast at work.. she also tailored our local cotton into a fine and standout piece. We worked together on having strips of the garment dyed in black walnuts, so as to created a well constructed and flattering back pattern. 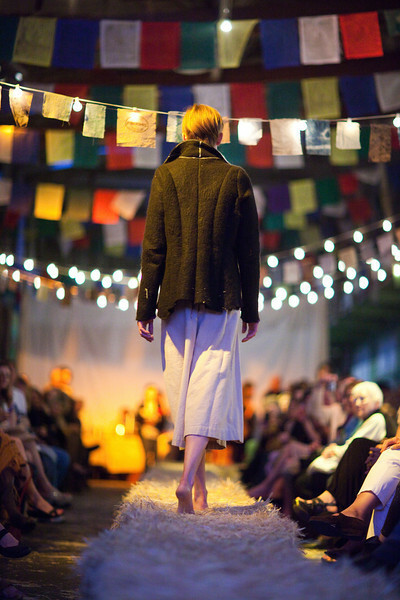 “I wanted the Fibershed to have tailored pieces, I think it is really important to answer the question of how or if local materials can be made into quality garments,” said Mrozinski. Mrozinski answered her own question in spades, and everyone who sees her work agrees.. the pieces are well constructed, beautiful and will hold the test of time. You’ve seen the pants in an earlier post… and here is my dearest and most favorite combination for more formal events… The Mrozinski and Fox fiber jacket, worn with my favorite basic tailored Fox fiber pants. Thank you Sally Fox, thank you Mali Mrozinski, and thank you black walnuts, and organic color-grown cotton! The fabric that Mali constructed this piece with– will once again be milled within our community: If you would like more information on the process we are undertaking to re-invent a bioregional supply chain: Come to and hear the stories and share in the most unique event of the season, entitled, Re-Weaving the Community Cloth. Sally Fox, Mali Mrozinski, myself and all of the other farmers and designers look forward to seeing you there!